A/B Box Liners. Our foil box liners for USPS Flat-Rate Boxes come as a kit to make 25 thermally shielded shipping containers. The kit contains 25 pairs of foil designed to fit USPS Flat-Rate boxes. 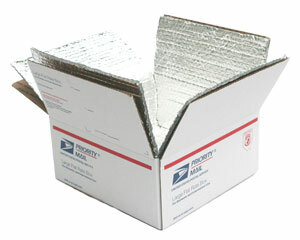 Simply pickup boxes from USPS.com and use our custom-cut foil to keep your perishables cool when in transit. Part # USPS Box Size Set Qty. Price Order Qty.